Compressed air is the air which is kept under a pressure having a value greater than the atmospheric pressure (1.03 kg/sq cm). It is a medium that carries potential energy. Compressed air is a widely used utility in a steel plant. It is an important source of instrument air. Other than instrumentation air which is completely dry and free from contaminants, there are the following three main uses of compressed air in a steel plant. Normally for blast furnace the cold blast air is supplied either by a turbo-blower or an electric blower. In the air separation plant, there are dedicated compressors producing compressed air of the specification needed by the air separation plant for the production of oxygen, nitrogen and argon gases. In case of compressed air being used as a utility gas, steel plants usually have either a centralized compressed air system or/and local compressed air systems. Compressed air is an expensive utility when evaluated on a per unit energy delivered basis. The advantage with the use of compressed air is that it can be easily stored in air receivers and readily available for brief peak demand periods. There are inefficiencies in converting electricity into compressed air as well as line losses in the compressed air distribution. Although the total energy consumption of such systems is normally small, compressed air systems are the most expensive energy in the steel plant due to its very low efficiency. Typical energy efficiency of a compressed air system is around 12 % to 15 %. Various measures can help run the compressed air systems at optimal efficiency and reduce their energy consumption and costs. Many pieces of production equipment in a steel plant are actuated by pneumatic cylinders. These include automatic feed devices, chucks, clamps, presses, intermittent motion devices (both reciprocating and rotary), and many other devices. Such devices usually have low air consumption. Compressed air operated tools and equipments are commonly called pneumatic devices. Pneumatic devices have high output to weight ratios. They use air motors, which are smaller and lighter than electric or hydraulic motors, providing superior ergonomics for the operator. They are ideal for tough applications especially in the areas of high temperature, dirty environment and frequent overloading. While pneumatic devices do require periodic maintenance to keep them at peak efficiency, they are very reliable under the above conditions and are almost indestructible. Pneumatic cylinders used for pneumatic devices generally have a soft feature. When the load exceeds the limit, pneumatic devices just stop working, whereas when electric and hydraulic driven devices overload, they can cause damage both to the devices as well as may injure the operator. 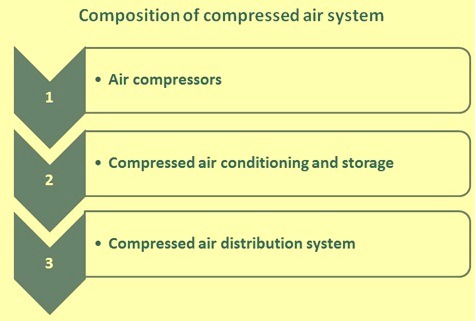 Compressed air distribution subsystems, including main lines, branch lines to specific users, valves, additional filters and traps, air hoses, possible supplementary compressed air conditioning equipment, connectors, and often pressure regulators and lubricators. Dynamic compression which is the conversion of the air velocity into pressure. Dynamic machines use axial and centrifugal impellers to impart velocity to the air, which is then converted to pressure. Centrifugal and axial compressors are dynamic machines often operating at high speeds. Displacement compression which consists of reduction of the air volume. Positive displacement machines use reciprocating piston, rotary screw, or vane types to produce air compression. Screw, reciprocating, and vane compressors are positive displacement machines. The capacity rating of air compressors is generally given in terms of ‘free air’, which is at atmospheric conditions of pressure, temperature and relative humidity and not at the pressure, temperature and relative humidity required at the pneumatic device to be operated. Air temperatures are typically around 120 deg C to 130 deg C at the outlet of the air compressor. Most modern air compressors have an after cooler located immediately after the compressor as a standard fitting to perform the function of removing water, and some oil vapour. Air compressors are available in single or multiple stages of compression. Multi staging is usually adopted when discharge pressure is equal to or more than 6 kg/sq cm. Multi stage compressor offers energy efficiency as air is cooled between compression stages and moisture is removed through cooling. Most of the compressors are controlled by the line pressure. Typically, a drop in pressure signals an increase in demand, which is corrected by increased compressor output. Rising pressure, indicating a drop in demand, causes a reduction in compressor output. Total supply of compressed air in the steel plant can be provided by either a single compressor or a multiple compressor installation which can be centralized or decentralized. Single compressor installations are best suited to smaller systems or systems which operate almost exclusively at full output. Multiple compressor installations offer numerous advantages which include (i) application flexibility (the ability to efficiently adjust to variations in the demand), (ii) maintenance flexibility, (iii) the option of centralized or decentralized operation, (iv) floor space flexibility, and (v) backup capability. Because not all compressors in a multiple compressor system remain on-line at all times, the actual air supply at any given time can be less than the total system capacity. During the time required to bring additional compressor capacity on line, stored compressed air can be used to prevent any pressure drop in the system. The amount of storage capacity needed depends on the amount of excess demand in cubic meter, available pressure differential between the compressor station and point of use, compressor start-up time, as well as the time available to replenish stored compressed air. The compressed air production normally includes necessary elements of compressed air treatment. Dryness and contaminant level are the two key factors used to distinguish low quality compressed air from high quality compressed air. The quality of compressed air required has the following three main considerations. Atmospheric air entering a compressor has certain humidity or contains some water vapour. Most of this water normally condenses at compressor discharge as the air is cooled in after cooler. The moisture in compressed air can be liquid water, aerosol (mist) and vapour (gas). The most noticeable and easily removable are water and aerosol, which can be removed by high efficiency filtration together with refrigeration dryers. Water vapour is more difficult to remove and requires the use of a dryer (desiccant type) together with high efficiency filtration. The general measurement of air dryness is dew point. Dew point is the temperature at which the air becomes saturated with moisture and the moisture begins to condense. Lowering the dew point effectively means the system can endure much lower temperatures before water droplets begin to condense. Filtration is a key factor in the proper operation and performance of a compressed air system. Removal of liquid and particulate contaminants is the basic requirements of the filtration. However requirements for vapour removal, ultra-fine filtration and catalyst filtration are used in specialized applications. Air filters can be located throughout the system and the number and type of filters varies according to the quality of air required. Air filters are usually divided into the following two categories. The air inlet filter for air compressors is intended to protect the compressor, but often is inadequate to protect downstream equipment. The compressor itself may add contaminants, including wear particles, carbon deposits, and lubricant. These require filtration. Filters are to be selected based on flow rates and pressure drop rather than pipe size. Excess pressure drop causes increased operating costs, short filter element life and overall reductions in system performance. An air receiver is a storage vessel for compressed air that acts as a buffer reservoir so that short term demand spikes can be met. It allows the compressor capacity to be temporarily exceeded. Often systems run a secondary compressor to cater for intermittent demand, compressor failure or short energy outages. The installation of air receivers may enable this compressor to be turned off. Air receivers create more stable pressure conditions. They work to dampen compressor pulsation and separate out particles and liquids. They make the compressed air system easier to control and additionally act as a secondary cooling device and as condensate collector. Installing a larger air receiver tank to meet occasional peak demands can even allow a smaller compressor to be connected. In most systems, the receiver is normally located before the dryer, as the accumulation in receiver gets cooled rejecting enough condensate. This reduces load on the dryer thus increasing efficiency of the dryer. Alternatively, multiple receivers can be used, one prior to the dryer and others closer to the points of intermittent/high demand. When a compressed air distribution system is properly designed, installed, operated and maintained, it is a major source of power, possessing many inherent advantages. Compressed air is safe, economical, adaptable and easily transmitted and provides labour saving power. The primary object of a compressed air distribution system is to transport the compressed air from its point of production (compressors) to its points of use (applications) in sufficient quantity and quality and at adequate pressure for efficient operation of the pneumatic devices. The ideal distribution system provides a sufficient supply of compressed air at the required pressure to all locations where compressed air is needed. However, many other considerations come into the design of the system to ensure the efficiency and safety of the total system. These include the following. Compressed air is required to be delivered to the point of use at the desired pressure and in the right condition. Too low a pressure impairs the pneumatic device efficiencies and affects the process time, while too high a pressure can damage pneumatic device, and can promote leaks and increase operating costs. Usually it is a balancing act which is done and getting the ‘just right’ can result into good savings for the plant. Here rate of flow considerations at the point of use is much more important. A properly sized receiver tank also provides sufficient storage capacity for any peaks in demands. During peak demand periods, a poorly designed system experiences a drop in pressure as air in excess of system capacity is taken out from the system. Compressed air distribution piping is the means for transporting compressed air and represents the link between supply, storage, and demand. A network of pipelines is used to supply different locations with compressed air. The flow of compressed air in pipelines, however, creates friction and results in pressure drop. Ideally the pressure drop in the pipelines is not to be not more than 0.1 to 0.2 kg/sq cm. The following steps are normally taken to reduce pressure drop. Friction loss is higher in longer pipes and in pipes with a smaller diameter. An effective way to reduce pressure drop is to use a loop system that provides two way flows at any point in the system, cutting the flow in each pipe path to half and reducing compressed air velocity. However more important than pressure drop caused by friction, is the pressure drop which is resulting from the system components themselves. This pressure drop typically ranges from 0.4 to around 1.5 kg/sq cm. This pressure drop can be controlled through careful equipment selection and proper maintenance of the compressed air system. Piping is critical to the reliability of the compressed air system and efficiency. Before laying the pipes, material choice, dimensions, layout, conditions on-site, and future needs are the factors which are required to be considered. Piping is to be rugged enough for the existing work conditions, provide minimum possible pressure loss and leakage, and be easy to maintain. Compressed air line piping can be black, galvanized, copper, or stainless steel piping. Each has advantages and disadvantages which should be carefully evaluated.